Notes: I can’t leave a good pattern alone it seems, so instead of knitting this as a triangular shawl, I knit it with faroe shaping. Of course this meant I ran out of yarn, even though I was *sure* two skeins (850+ m) was going to be enough. That said I actually like the edging, and I think blending it in worked pretty well. 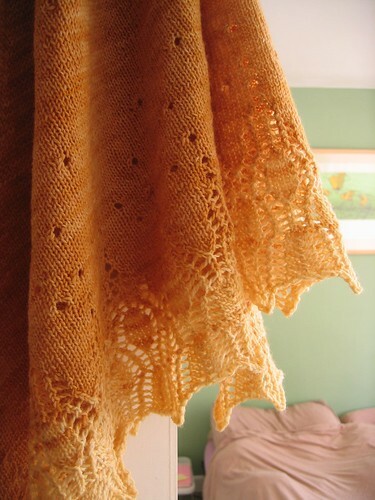 It actually finished this last December, but I remember it being a fun knit, despite only having a lace edging, rather than lace all the way through. 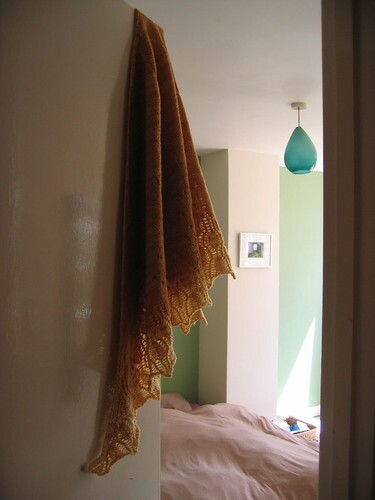 It’s a huge shawl – so much so that I can wrap it around the front of my body, and tie the ends at the base of my back (when I’m not *really* pregnant), which is a handy traditional way of wearing a shawl without having to fuss with it all the time. Conclusion? 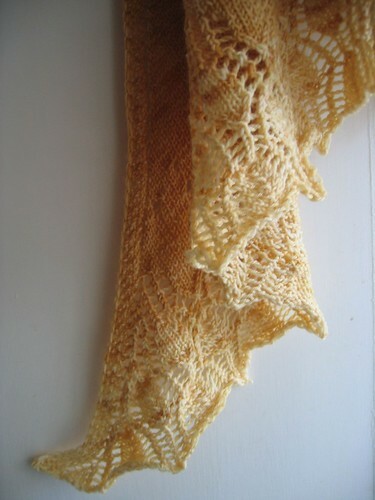 Great shawl, which I think really showed off the yarn. I’m really pleased with it. That is gorgeous. I love the shading. Very pretty indeed. Cute little bump ! Very neat. Emma – I hope this automatic returning email thing is working. 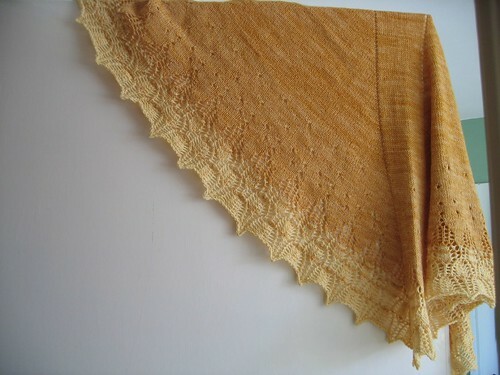 That is the best version of this shawl I’ve seen. I love the way you blended the colours at the edges; it gives it a really feathery appearance without overly fussifying the lace.